Home > Blog > Compliance > What Are Your Obligations Under the FCRA? What Are Your Obligations Under the FCRA? Ordering a background check for a potential employee seems like a fairly straightforward exercise: get the applicant’s information, send it to the background screening company, and receive a detailed background report that lets you know whether the applicant is clear to hire. In reality, procuring a background check on a prospective employee is decidedly more difficult than it seems on the surface. The process is governed by a patchwork of federal and state laws that require you, as an employer, to comply with certain rules and regulations. Perhaps the most critical of these laws is the Fair Credit Reporting Act (FCRA), with which employers that want to run background checks in the United States are required to comply if they engage a third-party background screening provider, known as a credit reporting agency (CRA). More than 40 years ago, Congress enacted the FCRA. Despite the use of the term “credit” in its name, the FCRA does far more than regulate “credit checks” that anyone looking to get a loan or open a charge account must undergo. Rather, the FCRA also regulates the exchange of consumer information between employers that use, and the CRAs that provide, background screening reports with other types of information, including criminal records. 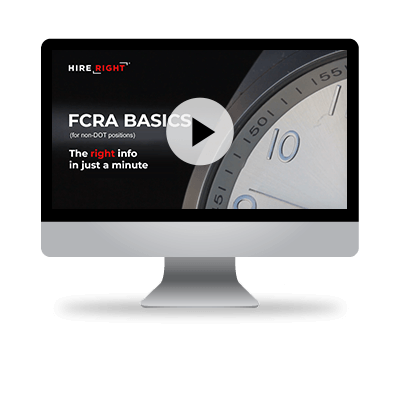 Generally speaking, employers must comply with the FCRA when they order virtually any type of report from a CRA, including reports derived from public record sources (e.g., criminal and motor vehicle records checks). While certainly employers that are experienced with background screening are likely familiar with their responsibilities under the FCRA, it is always helpful to review those obligations to better ensure you are in compliance with the Act. Before obtaining a consumer report from a CRA, typically you must make a clear and conspicuous written disclosure of such to the applicant. The disclosure must be in a document that consists “solely” of the disclosure. The applicant must then provide written permission for you to obtain a consumer report for employment purposes. You must make a certification to the CRA regarding your permissible purpose for the report, as well as your compliance with relevant FCRA provisions and state and federal equal opportunity law. After receiving the consumer report from the CRA, if you wish to take “adverse action” against the applicant, you must provide a “pre-adverse action” notice to the individual. This notice must include a copy of the consumer report and the Consumer Financial Protection Bureau’s (CFPB) Summary of Rights. A statement setting forth the applicant’s right to dispute directly with the CRA the accuracy or completeness of any information contained in the report that the CRA provided to you. In recent years, there has been a noticeable trend of litigation against employers for non-compliance with the requirements of the FCRA. By reviewing the above summary of your obligations under the Act, you can audit your current practices and better ensure your compliance with the FCRA. Considering that recent settlements in these cases have ranged between $2 and $3 million, this is an important exercise any employer should consider.